I spoke to inbetweengames, the developers of All Walls Must Fall in the middle of a successful crowdfunding campaign for their video game. Mary Ann Mahoney: Who is inbetweengames and how was it formed? Jan David Hassel: inbetweengames is a small indie game development team in Berlin, founded by us. We are three former YAGER veterans that worked on Spec Ops: The Line and Dead Island 2. We decided to go independent and found our own studio after our previous big game project at YAGER got moved to another developer very late into the project. At that point, we had already invested years of work and our lives into it. That was a tough pill for us to swallow, and so we decided that enough was enough. Now we’re independent and nobody outside the team can tell us what we can and cannot do. MAM: Briefly summarise your game for our readers and tell us what it’s about. JDH: All Walls Must Fall is a Tech-Noir tactics game set in Berlin, 2089 where the Cold War never ended. 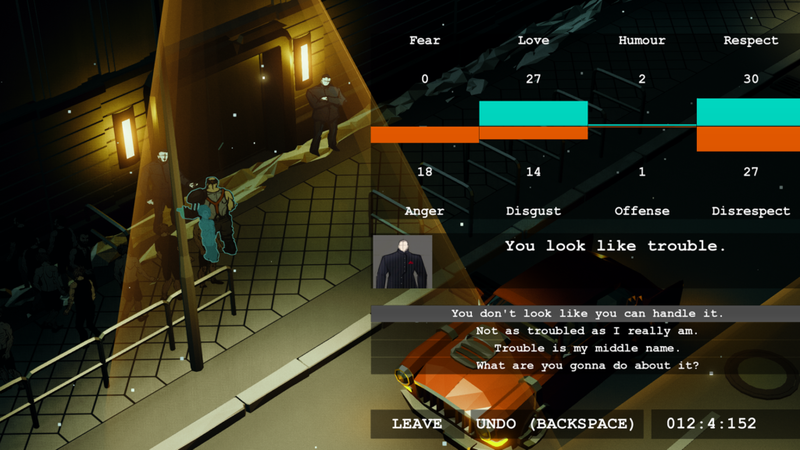 In the game, players command time travelling secret agents that have one night of clubbing to prevent a nuclear terror attack which will turn the Cold War hot. All missions take place in Berlin night clubs, obviously. James Bond goes into casinos, our agents go to techno bunkers. MAM: Music features quite prominently in the game. How have you gone about creating an original authentic German techno soundtrack? JDH: All action in the game happens on the beat of the music, and the music also dynamically adapts to what is happening in the game. Also, since there is time travel in the game, the music gives us a common reference frame to make the stretching, pausing, and rewinding of time understandable to players. So, music is very important for the core gameplay of the game, but also an important part of the setting. When we first started out, the first thing on the agenda was research. So, we went into clubs here in Berlin, visited shows by friends like Hanno Hinkelbein, and listened to a lot of electronic music to get a feel for what we wanted to recreate in a video game. Our programmer Isaac, and Almut, who is our audio lead, then got together and came up with a system for how we could dynamically adjust the music and make it work with our gameplay, as well. After we had the system setup and a few tracks ready to prove the concept, we then reached out to additional composers so that our soundtrack had more of an authentic feel and variety. We’ve been working with local Berlin DJs and video game music composers such as Hammy Havoc and Lost & Found to try and cover a variety of styles in Berlin electronic music. We also have some more collaborations lined up that we’re very excited about for our upcoming Kickstarter campaign for the game. We hope that the soundtrack and the game will go hand in hand in creating a believable world. MAM: What engine does the game run on? JDH: The game runs on Unreal Engine 4. Combined, the three of us have decades of experience with the engine as we’ve already shipped games on the last console generation with Unreal Engine 3 and have made the jump to the next engine generation very early on. Most other indies tend to use Unity because of it’s easy to use. But, for us, Unreal is the best tool as it allows us to do things that we simply couldn’t pull off with another engine. MAM: Do you feel that there’s never been a better time to be an indie developer creating interesting and innovative smaller genres more akin to the titles of yesteryear when major studios are rehashing the same franchises year on year, spending millions of dollars with diminishing returns year after year and little innovation? JDH: Ha-ha, that’s a pretty loaded question but yes! We’ve been in the arms race of AAA development for years, so we know how it feels to be part of that machine that pushes out big games. Games today really aren’t the same thing anymore compared to what they were when we got interested in them and decided that this was what we wanted to do with our lives. There is a lot of focus on visual fidelity and production value that often results in the core mechanics of the games falling short of the visual grandiosity and pure volume of repetitiveness but compelling hours of gameplay they offer. With All Walls Must Fall, we’re able to reverse that in a way. It is a very complex game, touching on a number of difficult subjects, and its visual aesthetic is more based on style and timeless artistic expression than just crunching out the biggest number of polygons and shader effects. At least that’s what we’re trying to do. MAM: Do you feel that the games industry is in a healthier place than it has been for the past few years now that digital distribution and developers and publishers go direct to market via stores without going to a publisher is the norm? JDH: That was the glory of the big indie wave hitting around 2012! But I don’t think going without a publisher is the norm yet or will be anytime soon unless you’re a hobby developer. There are many things that developers don’t necessarily want to do or are even good at doing that publishers usually help out with. The most obvious one is money but, of course, that comes at a price and that’s where the problems start. It’s a very tough spot to try and reach to be truly independent in that way. We were lucky that we received some initial funding help from the Medienboard Berlin-Brandenburg which allowed us to get the game as far as it is without having to go to a publisher. Now it’s up to our potential players to show us how big the audience for this game really is, and whether we can make it happen via a Kickstarter campaign. But, all in all, I’m not sure whether the games industry is a healthier place. It still has the same problems, the same struggles, the same waves of hype and crushing realizations. It has become more diverse and splintered and bigger, though. That’s probably a good thing as it makes things more interesting. MAM: Do you feel that digital distribution has lessened the value of arts such as video games and turned them into a disposable form of medium that doesn’t necessarily guarantee discovery, sales, and ongoing profit? JDH: Digital Distribution has made us all as consumers, ridiculously rich in the amount of information and entertainment that we can reach. At the same time our time and attention has basically stayed the same. So, I think the true currency now is exactly that: time and attention. If anyone spends their time and attention on something, then eventually that can also generate income for the provider of that medium. MAM: Is the game going to receive any DLC? JDH: We really want to reach an open development model with the game. This will start with a closed alpha for our Kickstarter backers, eventually going into an open alpha on Steam Early Access. During that time, there will be regular updates to the game as we continue to develop it. So, in a way, most of the game will arrive as continuous downloadable content over a longer timeframe. But all of it will be included in the base price of the game. If you own the game you will own all of it including all future additions. Again, for us, people giving us their time and attention is more important than trying to milk someone for money. We hope that when players see and realize that whatever we can, we put back into the game and give it to them, that they will honour and return that trust. That’s the way we want it to work out, at least. We don’t know if it’s going to work yet, but that’s what we believe in and what we want to do. MAM: What platforms will the game be available on? JDH: The game will be available for PC on the common current operating systems so Windows, Mac and Linux. Since we’re using Unreal Engine 4, and have worked on consoles before, it’s possible that we could put it on other platforms as well, further down the line. But for that to happen, the PC release must go well enough that we can spend the time and do it. We also would want to make sure we get the controls and user interface right, which is often underestimated, unfortunately. MAM: What games and developers do you personally enjoy? JDH: It has become very tough for me to play games personally, and not spoil them for myself by starting to analyse different aspects of how they’re put together on a design, technical, artistic or production level. Having worked in AAA games production and on an open world action RPG, I tend to enjoy those games best that value my time and try to do something meaningful with it. I can see how and why the grind of big games works, but I’m putting myself on a diet when it comes to that as best as I can. It just doesn’t feel like a meaningful way to spend my time with a game. So, I tend to enjoy smaller indie titles and those games that have an interesting emotional impact. But, occasionally, I still get lost in some grand strategy, RPG, or online game. It has just become harder to lure me in, I suppose. I also closely follow what is going on, and often interview my friends about what games they play and how they’re feeling about them. Another way to analyse those games, I suppose, is that they’re like a big focus test. I just can’t help it. As for developers, there are many that I respect greatly, and whose work I follow. I tend to like those who are daring best, and who go out of their way to do something they believe in. Some of them are my friends. MAM: Do you feel the procedurally generated content and roguelikes are what the general gamer wants to play? Isaac Ashdown: I don’t really think that gamers are too bothered about how exactly the content is created. What they care about is good content, fun stuff. Procedural generation is just one tool that developers can use that has advantages for a small studio like ours, compared to custom making every level. We can’t create every single level by hand, as we just don’t have that many people on the team, but we want to make a game that’s got enough content that every time you play it, you get a different experience. Procedural content generation allows us to do this, but we still want our content to be good and compelling. So, we have our level generator stitch together segments of levels, each of which has been designed by us by hand. That, hopefully, allows us to meet both the goals of it being interesting and varied. MAM: Do you feel that the success of video games such as Minecraft hinges upon their ability to provide seemingly limitless content to players through procedural generations, giving good bang for buck and interesting seeds to discover within the community? IA: It’s certainly one of their selling points, as exploration only works when you’re exploring the unknown. MAM: How did All Walls Must Fall come to have such a unique graphical aesthetic? IA: David and I have been real fans of Rafal Fedro and his 2D artwork for a while, and it was great that we could work together on this project. Having 2D characters allows us to show off his talent. We also like the approach of old school games that were being made when 3D was a new technology, which stitched together 2D characters with 3D environments. So, we decided to try it out, and it worked out, being a great fit for both the game and for our development processes – we can use all of Unreal Engine’s fancy lighting features to make a somewhat minimal environment really moody and atmospheric. MAM: What are the biggest challenges you’ve faced as an independent developer for All Walls Must Fall? IA: We’re lucky to be in Berlin, where there’s some good opportunities for getting funding from the Medienboard Berlin-Brandenburg, for example. But still, securing funding to develop the game is always going to be a big challenge that is relied on by any new business. MAM: Do you have any advice for aspiring game developers? IA: Game development is great because it provides employment and opportunities to people with a lot of different specialities; from coding, to art, graphics, design, production, and testing. These all need really different skill sets, so there’s probably something that’s suitable for just about one person. So, find the part of game development that excites you the most, and get really, really good at it. MAM: What gameplay mechanics make All Walls Must Fall so unique? IA: The way everything happens on the beat of the music, and yet the game isn’t exactly a rhythm game, is pretty unique. A big inspiration for that was REZ, so it’s not like it hasn’t been done before, but REZ came out a long time ago. We blend all that with our tactical, time-travelling system, to create an experience where the player creates an additional musical element with their gunfire and other sound effects, that layers into the music and almost creates a new composition unique to them. MAM: What does Berlin mean to you? How does All Walls Must Fall celebrate the culture of Berlin? IA: I’ve been living in Berlin for long enough now that it means many things, but primarily it’s home. It’s a place full of weird, lovely people who do all kinds of interesting things, and that’s what we want to celebrate with the game. And techno, of course. MAM: Does utilising a crowdfunding campaign allow you to remain truly independent and create the game you game you wanted to create? IA: Pretty much! Of course, we’re beholden to our backers now, who we don’t want to disappoint! But I’m pretty confident they will only help us make the game better as we move into getting them on board with the Closed Alpha. MAM: What perks are available for those who want to back your campaign? JDH: Well the basic perk is the game itself – you can either wait until it’s publicly available, which will be towards the end of the year, or you can get access to the Closed Alpha which we’ll be beginning in May. There’s also opportunities to influence the game by getting your name on a Bartender character, or having our artist, Rafal, do a portrait of you which will be on a narrative character. And, of course, you can also get add-ons, like an awesome t-shirt or poster! MAM: It’s been great talking with you both today. Be sure to back All Walls Must Fall on Kickstarter now, they’ve already reached their crowdfunding goal of €15,000 and are now into stretch goal territory! Will all games eventually be browser-based?